Don recently purchased a motorcycle for his daily commute to work. It is a sweet machine! 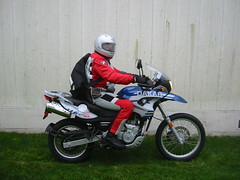 A BMW 650 GS. Though the bike is more fitted to negotiate the trails of the Andes Mountains than the pavement of Highway 16, Don does enjoy his new mode of transportation. Maybe someday he'll tackle the Alaskan tundra or the Baja desert. The smart looking riding gear hides a cautious middle aged school teacher.